ANN ARBOR, Mich. --- In the largest study of its kind ever conducted, researchers have determined that Adventists find it absolutely impossible to hold hands in a circle without singing the chorus Side by Side. 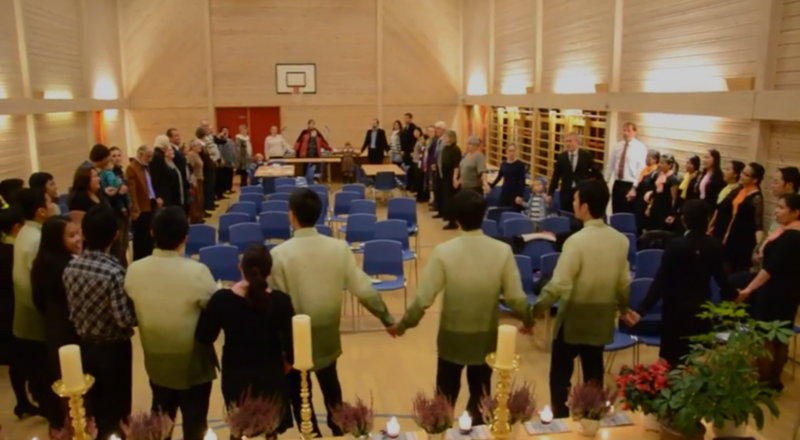 A team of anthropologists from the University of Michigan say that regardless of context, Adventists burst out in song with the exact same chorus within one minute of getting into circle formation and holding hands. "This is shockingly consistent behavior," said Kumba Yah, spokesperson for the group of anthropologists. "It doesn't matter where you are in the world or whether the Adventists present are holding hands or have linked arms, you better believe Side by Side will be sung in at least one language." Yah said that the behavior can be traced to Adventists learning the song very early in life. "By the time they reach Pathfinder age, the lyrics "Side by side we stand..." come as second nature," said Yah. "And unlike any memory of stuff they learned in the soap carving honor, Side by Side sticks." Gazillions. The cookie is quite large about the size of a piece of Manna.